FreeFromMold.org gives you the tools you need to determine places around your house in need of inspection for typical moisture intrusion problems and offers simple steps to fix these problems. Routine home maintenance can prevent most of the moisture damage found in houses today. This content is structured around the Ten-Point Protection Plan, which offers ten key areas of the home you should protect against moisture intrusion. While the Ten-Point Protection Plan offers a basic overview, also included are detailed guidelines of what to look for in these ten areas of the house and simple solutions for some of the common problems that allow mold to fester. For ease of understanding, the ten areas of the house are subdivided into three categories: exterior, perimeter, and interior. FreeFromMold.org grew out of APA’s Build a Better Home program, which offers construction details and guidelines that builders should follow to ensure their homes can withstand moisture intrusion. The Build a Better Home program explains better building practices for foundations, walls, and roofs, and includes examples from a demonstration home at the U.S. Forest Products Laboratory in Madison, Wisconsin. Learn more about Build A Better Home. 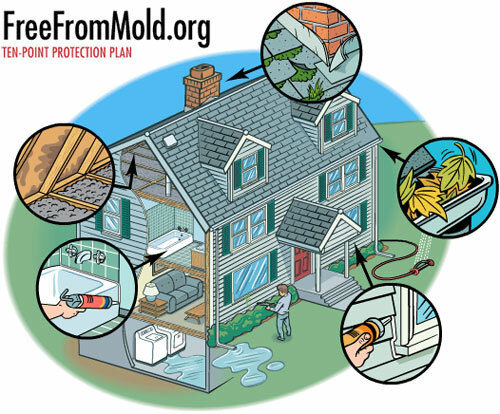 The FreeFromMold.org Ten-Point Protection Plan offers an overview of the ten areas of the home to concentrate on when inspecting for mold and moisture intrusion problems. For details of how to enact these ten points or for more recommendations specific to that part of the house, view the exterior, perimeter, and interior pages. Roof – Carefully remove debris build-up in valleys and at wall-to-roof intersections. When removing debris, make sure that it doesn’t enter and clog downspouts. Inspect flashing around chimney and penetrations. If flashing has cracked or pulled away, call in an expert to repair. Remove moss and lichen growth with a moss killer, broom, or garden hose. Pressure washing can shorten shingle life. Direct water down the roof, never up under the shingles. Gutters/Downspouts – Clean gutters with a blower, garden hose stream, or small broom. Using a hose will help pinpoint leaks and other trouble spots. Be sure to prevent debris from entering and clogging downspouts. Use gutter sealer on loose joints or replace gutter sections according to manufacturer’s instructions. Make sure that downspouts are clear of debris and drain away from the house. Windows/Doors/Siding – Inspect and recaulk siding joints as necessary around windows, utility penetrations, and doors. Check that weather-stripping around doors and windows seals tightly to prevent water from entering. Drainage – Make sure that perimeter ground slopes away from the foundation. If downspouts dead-end near the foundation, add splash blocks to redirect water away from the foundation. Sprinklers – Water your plants, not your house. Redirect lawn sprinklers so they do not wet the siding, windows, or foundation walls. Landscaping – Trim plant life away from the siding. Large shrubs or vegetation may need to be moved if foliage persistently contacts siding, windows, or utility penetrations such as dryer vents. Attic – Look for water stains on the underside of the roof, rusted nails and discolored mildewed sections on any surface. If you find any of these moisture warning signs, look for the source of the moisture. These could be from water leaks or a faulty ventilation fan that is directing moist air into the attic space instead of to the outside. Also check that vents at the eaves are unobstructed by insulation and that there is room for air to flow from the eaves (soffit vents) into the attic space and out the upper roof vents. Ventilation – Install timers on bathroom and laundry fans, and run fans for 20 minutes after showers. Your bath/kitchen/laundry fan ducts should vent outside and never terminate in the attic. Vent dryers to the outside of the home. Kitchen/Bath – Inspect plumbing fixtures, paying particular attention to areas under sinks and toilets and around shower and tub enclosures. Look for stains, cracks, and mold on caulk or any other surface and repair as necessary. Basement/Crawlspace – Check your basement and crawlspace for moisture problems: standing water, mildew on floor joists, or rust on metal fasteners. Replace any loose or missing batt insulation. Install a 6-mil polyethylene vapor barrier over exposed ground in crawlspace. If you find serious moisture damage or standing water in either the crawlspace or basement, call a contractor to repair and correct any structural problems and eliminate the source of the moisture.